A traditional tube-shaped fluorescent lamp in a simple fixture. A fluorescent lamp, is a type of electric light (lamp) that uses ultraviolet emitted by mercury vapor to excite a phosphor, which emits visible light. There are two general types, traditional fluorescent and compact fluorescent. This article is about traditional fluorescent lamps. The purchase price of a fluorescent lamp is often much higher than an incandescent lamp of the same output, and the light from fluorescent lamps looks different to light from incandescent lamps. Fluorescent lamps have a longer rated life and use less energy than an incandescent lamp of the same brightness. 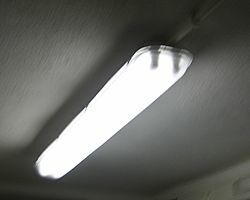 A fluorescent lamp can save over US$30 in electricity costs over the lamp’s lifetime compared to an incandescent lamp. An electric current is applied to mercury vapor inside the tube, causing it to emit ultraviolet (UV) light. A phosphor on the walls of the tube absorbs the ultraviolet light. This causes an electron to jump up to an orbital with a higher energy. When the electron drops back down to its normal orbital, the phosphor re-emits its energy as visible light. The ballast prevents too much electricity from flowing through the tube. It also starts the lamp with a high voltage for a split second when it is switched on. The ballast is located inside the fixture in traditional fluorescent fixtures (in compact fluorescent bulbs is often in the base of the bulb). There are two types of ballasts, magnetic and electronic. Magnetic ballasts have mostly fallen out of use, as they are less efficient than electronic ballasts, they cause the bulb to flicker, and they do not start instantly. Electronic ballasts were at one time more expensive than magnetic ballasts, but now the price is about the same. The average rated life of a fluorescent light bulb is 8 to 15 times longer that of incandescents. Fluorescent light bulb typically have a rated lifespan of 7,000 to 15,000 hours, whereas incandescent lamps are usually manufactured to have a lifespan of 750 hours or 1,000 hours. The lifetime of any lamp depends on many factors, including operating voltage, manufacturing defects, exposure to voltage spikes, mechanical shock, frequency of cycling on and off, lamp orientation, and ambient operating temperature. The life of a fluorescent lamp is significantly shorter if it is turned on and off frequently. In the case of a 5-minute on/off cycle the lifespan of a fluorescent lamp can be reduced to "close to that of incandescent light bulbs". The U.S. Energy Star program suggests that fluorescent lamps be left on when leaving a room for less than 15 minutes to avoid this problem. If the light must be switched on and off frequently, Cold cathode fluorescent lamps can be used. Cold cathode fluorescent lamps are designed for many more on/off cycles than standard lamps. 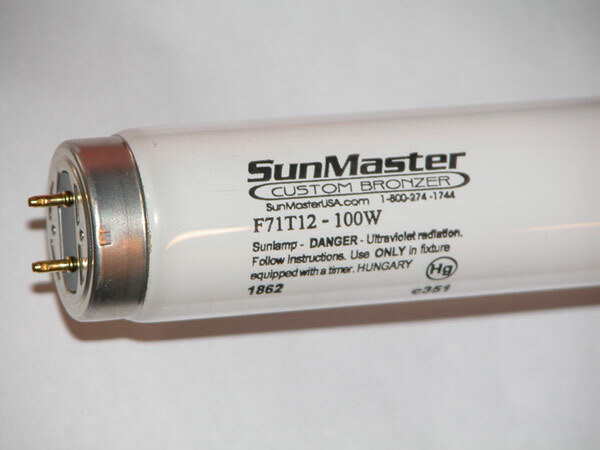 The mercury inside the tube is toxic and makes these bulbs hazardous waste. The bulbs must be taken to a recycling center after they stop working. 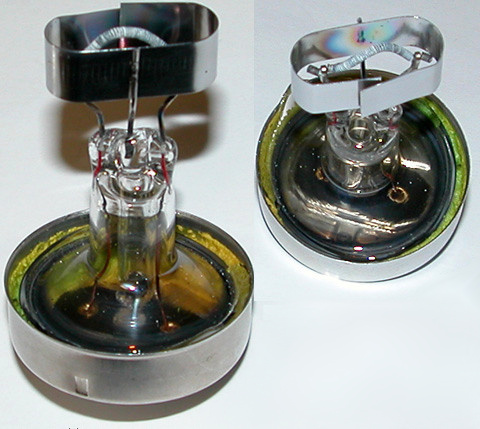 During normal use, the mercury cannot escape, although it will escape if the bulb is broken. If a single bulb breaks, it is not usually a cause for concern. It is recommended to open windows to air out the room, and to clean up broken glass with duct tape instead of a vacuum cleaner. Many people and businesses do not want to use fluorescent lamps due to their mercury content. Halogen, LED, and traditional incandescent bulbs are possible alternatives. Top, two compact fluorescent lamps. Bottom, two fluorescent tube lamps. A matchstick, left, is shown for scale. Typical F71T12 100 W bi-pin lamp used in tanning beds. The (Hg) symbol indicates that this lamp contains mercury. In the US, this symbol is now required on all fluorescent lamps that contain mercury. Inside the lamp end of a preheat bi-pin lamp. In this lamp the filament is surrounded by an oblong metal cathode shield, which helps reduce lamp end darkening. 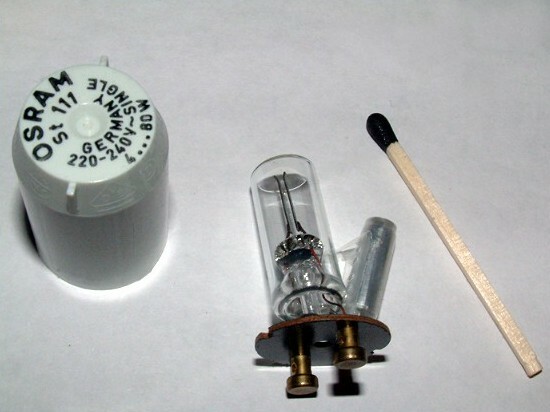 A germicidal lamp uses a low pressure mercury vapor glow discharge identical to that in a fluorescent lamp, but the uncoated fused quartz envelope allows ultraviolet radiation to emerge. 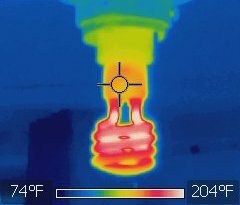 Thermal image of a helical fluorescent lamp. A rapid-start "iron" (magnetic) ballast continually heats the cathodes at the ends of the lamps. This ballast runs two F40T12 lamps in series. Fluorescent tubes that are perpetually lit eventually suffer from mercury adsorption. As the pressure within the lamps decreases, the arc discharge becomes a glow discharge, dimming considerably and displaying the accompanying "Faraday cones", which appear as rings of light that move across the lamps. 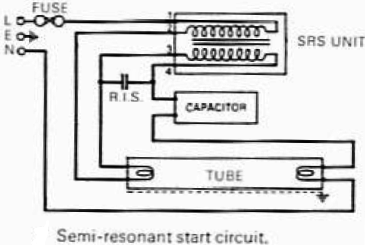 This tube, which was turned on and off regularly, could no longer start after enough material had sputtered from the cathodes, causing their work function to increase beyond an operable level. The vaporized metal adheres to the glass surrounding the electrodes, causing it to darken and turn black. Light from a fluorescent tube lamp reflected by a CD shows the individual bands of color. A helical cool-white fluorescent lamp reflected in a diffraction grating reveals the various spectral lines which make up the light. Fluorescent spectra in comparison with other forms of lighting. Clockwise from upper left: Fluorescent lamp, incandescent bulb, candle flame and LED lighting. Capacitive coupling with high-voltage power lines can light a lamp continuously at low intensity. One of the first mercury vapor lamps invented by Peter Cooper Hewitt, 1903. It was similar to a fluorescent lamp without the fluorescent coating on the tube, and produced greenish light. The round device under the lamp is the ballast. Closeup of the filament on a low pressure mercury gas discharge lamp showing white thermionic emission mix coating on the central portion of the coil acting as hot cathode. Typically made of a mixture of barium, strontium and calcium oxides, the coating is sputtered away every time the lamp starts, often eventually resulting in lamp failure. Magnetic single-lamp ballasts have a low power factor. Fluorescent lamp Facts for Kids. Kiddle Encyclopedia.